Situational awareness: Brace yourselves for a wild week. Supreme Court nominee Brett Kavanaugh and his accuser, Christine Blasey Ford, are expected to testify on Thursday; an important NAFTA deadline looms; and with the Sept. 30 government funding deadline arriving next Sunday, Trump has to decide whether he's going to shut down the government because Congress won't give him enough money to build his wall. For D.C. readers: An Axios vape event! Join Mike Allen for breakfast this Tuesday where he'll go deeper on the rapid rise of vaping and why it matters with FDA Commissioner Scott Gottlieb, American Vaping Association President Gregory Conley and CATCH Global Foundation CEO Duncan Van Dusen. RSVP here. 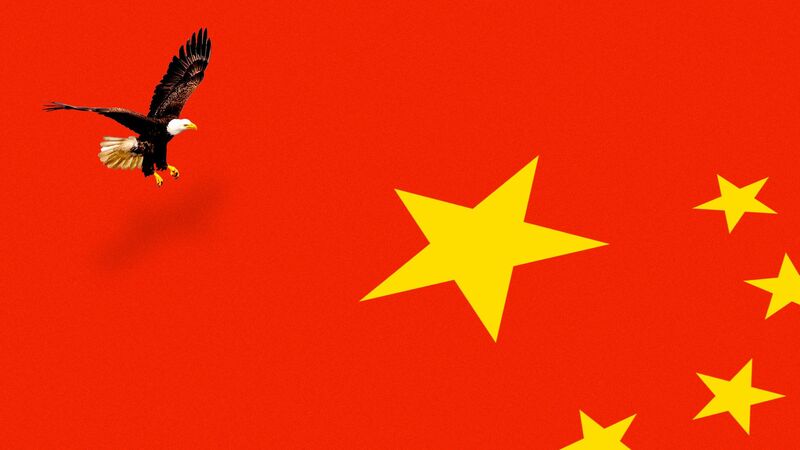 The broadside against China — which is planned to be both rhetorical and substantive — will be "administration-wide," including the White House (led by senior officials on the National Security Council), Treasury, Commerce and Defense. President Trump will address the United Nations General Assembly on Tuesday. A source briefed on his remarks shared one word on his theme: "Sovereignty." "Mutual respect and sovereignty" will be his frame for cooperation with other countries, another source with direct knowledge of his remarks told me. He'll talk about reforming international trade, that source added. With John Bolton as his national security adviser — a man who has fought for decades against international institutions that he believes infringe on U.S. sovereignty — Trump will have plenty of material for such a speech. In his speech to last year's UN General Assembly, Trump branded Kim Jong-un "Rocket Man" and said the U.S. may have "no choice but to totally destroy North Korea." Foreign officials were shocked. They'd never heard such incendiary rhetoric from a U.S. president. And Trump loved the headlines. "So you'll have to wonder what the target will be this time, who he will vent against," a Washington diplomat mused to me. On North Korea: According to a source who's spoken with Trump about North Korea this week, Trump feels good about the latest developments and is "very happy" about the latest letter he received from dictator Kim Jong-un. But hawks worry Trump will be concede too much to North Korea before Kim completely and irreversibly denuclearizes the Korean Peninsula. Sen. Lindsey Graham, who is close to Trump, told me, "Here's what I'm concerned about: The letters that Kim Jong-un is sending to Trump are good. It's good to keep a dialogue. But the letters and the behaviors do not match up. "I am very worried about President Moon [of South Korea], who I think is the President Obama of Asia, putting President Trump in a bad spot." "The last thing you want to happen is to lose control of the negotiations. I don't know how much Moon is freelancing here ... but the worst possible outcome is for us to talk about ending the Korean War with a peace treaty before they have a program to give up their nukes." "That's what they want the most, to end the war, get normal relations, have security agreements. But all that comes at the end, not the middle." Trump plans to address a counter-narcotics summit focused on opioids on Monday, sources familiar with the event told me. Much of the illegal opioids ravaging American streets are coming from factories in China. "Democrats hold a 12-point lead in congressional preference among registered voters," according to a new national NBC News/Wall Street Journal poll. In August, the same poll had Dems up by 8 percentage points. The shift is within the poll's margin of error, but it reflects mounting bad data for Republicans heading into November. Why this matters: If Democrats hold a 12-point generic ballot lead on Election Day, they would comfortably take the House. "It was this week in 2010 when the bottom fell out for the Democrats. That's why the Republican campaign committees and outside groups are hoarding money. "They aren't going to spend millions propping up GOP incumbents who didn't do their jobs just so they could limp into October only to lose by double digits a few weeks from now. Bottom line: "There are probably a dozen or so GOP incumbents who are dead men walking," the former NRCC official said. "They just don't know it yet." Why it matters: The uncertainty and sensitivity of Thursday's showdown has key senators scrambling to prepare for the moment, writes my colleague Alayna Treene. Some of the biggest tech and telecom companies are preparing for members of the Senate Commerce Committee to grill them over their data practices this week. Why it matters: Industry players are trying to shape the debate as Congress considers passing its own privacy rules, writes my colleague David McCabe. "Consumers deserve clear answers and standards on data privacy protection," says committee Chairman John Thune (R-S.D.) in a statement. Witnesses include staffers from Google, Amazon, Apple, Twitter, AT&T and Charter Communications. While Thune wants to produce privacy legislation, that may not happen until next year. What we're hearing: The companies will take different approaches depending on how key user data is to their business models. Google expects to defend its underlying business while endorsing the broad idea of privacy regulation. It will release its own framework for privacy rules ahead of the hearing. "We want to reiterate how important user trust is to our business and our long-term success. It feels like that gets lost in the public conversation sometimes," the search giant's Chief Privacy Officer Keith Enright tells Axios. Silicon Valley is playing defense in more ways than one this week, as Attorney General Jeff Sessions is expected to convene a meeting with his state counterparts to discuss concerns about major social media platforms. Apple will pledge its support for "comprehensive" federal privacy regulations during a Senate hearing this week, according to an executive's prepared testimony obtained by Axios. It'll be the first time Apple has made this explicit to Congress. The big picture: Expect Apple's Bud Tribble to underscore the difference between the hardware maker, which doesn't need to make money from user data, with companies like Google, which have built their business model on it, my colleague David McCabe writes. What he'll say: Tribble, a member of the original Apple Macintosh design team who leads the company's privacy engineering work, will "convey Apple's support for comprehensive federal privacy legislation that reflects Apple's long-held view that privacy is a fundamental human right" during a Senate Commerce Committee hearing on Wednesday. "We want your device to know everything about you; we don't feel that we should," he’ll say. "These concepts have guided our design process for years because privacy is a core value at Apple, not an obligation or an aftermarket add-on." Trade watchers call Sept. 30 the "AMLO deadline" for President Trump's efforts to renegotiate the North American Free Trade Agreement. If the Trump administration can't strike a deal with Canada and Mexico by next Sunday — and the Canadians are showing few signs they'll comply with Trump's demands — it means Mexico's incoming leftist leader Andres Manuel Lopez Obrador (AMLO) would have to sign the final deal. Everyone involved has been trying to avoid that scenario. AMLO has campaigned on far more aggressive changes to NAFTA than have been agreed to by Trump and current Mexican President Enrique Peña Nieto. It's an image issue; AMLO and his team don't want his face tied to the new NAFTA, so by Pena Nieto signing the deal, he gives the new leftist leader political room to claim the new deal was a "fait accompli." Delay the release of the trilateral deal, which would be a concession that AMLO has to be the one to sign the deal. Publish the text of a U.S.-Mexico only agreement. That would raise all sorts of questions, including how to get such a deal through a very skeptical Congress and how these amazing new automobile rules of origin would work without Canada. Go deeper: To understand the fraught state of the NAFTA negotiations, read Phil Levy's latest for Forbes. "It really means," writes Levy, "that the odds of a revised NAFTA being implemented anytime soon just went from slim to slightly slimmer." The House will pass the most important spending bill of the season. The package contains funding for the departments of Defense, Labor, Health and Human Services, and tacked onto it is a short-term continuation of funding for the remaining government agencies that didn't have their funding covered by normal spending bills. The bill, which keeps the government open until Dec. 7, will go to Trump's desk this week. The government runs out of money on Sept. 30, and Trump has been publicly flirting with the idea of shutting down the government because Congress won't give him the money he needs to build his wall. This bill won't have Trump's wall money, but he's privately assured Republican leaders Mitch McConnell and Paul Ryan that he'll defer this politically costly fight until after the November midterm elections. The Senate will confirm Jackie Wolcott to be the U.S. representative to the International Atomic Energy Agency. McConnell will also work to confirm Peter Feldman to be a commissioner of the Consumer Product Safety Commission. But Capitol Hill will be preoccupied by one event: Brett Kavanaugh and his sexual assault accuser, Christine Blasey Ford, testifying before the Judiciary Committee. After days of negotiation, Ford's lawyer agreed today that her client would appear at the open hearing, 10 a.m. Thursday. Monday: Trump will address a counter-narcotics session titled, "Global Call to Action on the World Drug Problem." The president will also host a reception for heads of state and will have bilateral meetings with South Korean President Moon Jae-in, Egyptian President Abdel Fattah al-Sisi and French President Emmanuel Macron. Tuesday: Trump will address the 73rd Session of the United Nations General Assembly — his major speech for the week. Trump will have "pull-aside" meetings with UN Secretary-General Antonio Guterres and UNGA President Maria Fernanda Espinosa. Trump will also have a bilateral meeting with Colombian President Ivan Duque Marquez, attend a lunch hosted by Guterres, and the U.S. UN Ambassador Nikki Haley’s "Security Council Presidency Reception." Wednesday: Trump chairs the UN Security Council briefing on "counter-proliferation." Trump tweeted on Friday that he would focus the meeting on Iran. Trump will also have bilateral meetings with Israeli Prime Minister Benjamin Netanyahu, Japanese Prime Minister Shinzo Abe and UK Prime Minister Theresa May. On Saturday morning, NBC’s Chuck Todd met with Mike Pompeo in the ornate Ben Franklin room of the State Department ahead of their “Meet the Press” taping. Their small talk before the interview, according to a source with direct knowledge, turned to CNN's amazing punctuation scoop: "Pompeo cracks down, on improper use, of commas at State Department." A leaked State Department email obtained by CNN suggests the secretary of state "appears to have had it, up to, here, with, the rampant, improper use of commas by State Department staff." "It also notes that Pompeo prefers adherence to the Chicago Manual of Style…"
Pompeo's staff wouldn't comment on internal documents, but my source confirms the secretary's debate with Todd "spanned from the proper use of the comma to the semicolon."